Although bacalhau is considered to be Portugal’s national dish, the pastel de nata is its most famous. This pastry is quite simply perfection in two bites. There are other Portuguese cakes and pastries, and other great savoury Portuguese dishes, but nothing comes close to the pastel de nata. These days, you can find pastéis de nata (or Portuguese custard tarts) in just about every major city around the world, from Amsterdam to Auckland. But, and not meaning to disparage the efforts of other bakeries around the world, don’t assume that just because you’ve had a pastel de nata outside of Portugal that you’ve had a proper pastel de nata. Unless you’ve been to a Portuguese-owned bakery, there’s a good chance it wasn’t an accurate representation of the real thing. Don’t worry, though: now you have a mission while you’re in Portugal. You’ll find a café on just about every corner in Portugal, and every café in Portugal sells pastéis de nata. 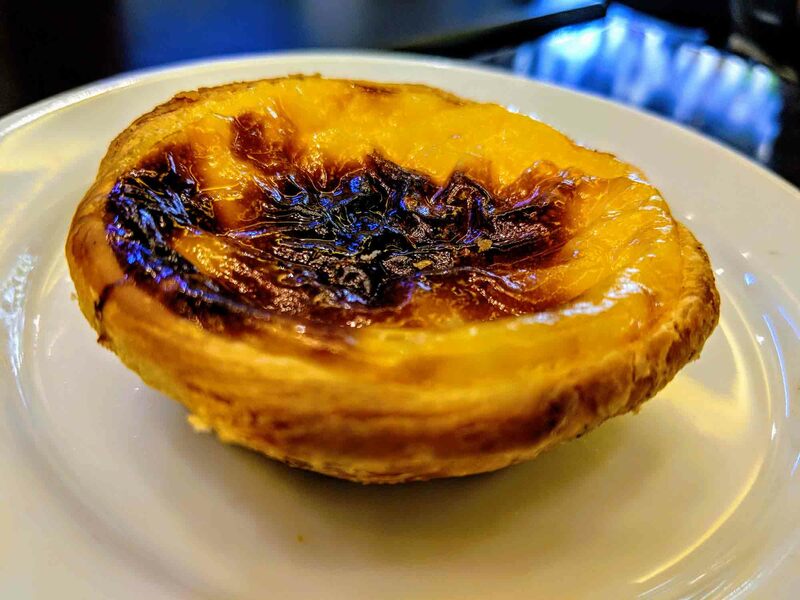 In Lisbon, where the recipe originates, there are several bakeries that specialise in making them (including obviously Pastéis de Belém) and it’s worth trying them all to see which you think is the best (more on that below). Is it a Pastel De Nata or a Portuguese Custard Tart? Portugal, as mentioned, has some fantastic cakes and pastries and many of these were invented in monasteries and convents. Back in those days egg whites were used for starching clothes, particularly nuns’ habits, which meant they had a lot of egg yolks left over. The yolks were often used to make sweets and pastries, and this led to the invention of sweets like ovos moles, queijadas, and of course pastéis de nata. The pastel de nata was invented by monks at Jerónimos Monastery in Belém, which is now a neighbourhood of Lisbon. It’s possible that the monks learnt the art of pastry making while in France, as many of the monks had spent time there. The monks would sell the pastéis de nata at a nearby sugar refinery to raise money for the monastery, and word soon spread about how tasty they were. Unfortunately, despite their attempts to keep the monastery afloat, the monastery eventually closed down in 1834 and the monastery sold the recipe to the owner of the refinery, a Portuguese businessman from Brazil named Domingos Rafael Alves. Alves later opened Pastéis de Belém, which is still run by his descendants to this day. Only a handful of people know the recipe that Alves bought, and it’s a very closely guarded secret. All of the baking happens in a room known called the Oficina do Segredo (the Secret Office) and all of the bakers have to sign a confidentiality agreement. Despite all of the secrecy, many Portuguese bakeries have taken a stab at making them and many have come pretty close to replicating the original recipe. Some, might have even topped it although that’s always a subject that leads to a big debate. Until very recently, it was rare to find pastéis de nata outside of Portugal with the exception of former Portuguese colonies and places with large Portuguese communities. Little Portugal, in London, is one example of a Portuguese community where you’ll find several Portuguese-owned cafés, and there are also plenty of Portuguese living in New Jersey in the United States. Pastéis de nata can also be found in parts of China (where they are called “dan ta”, Macau, and Brazil. These natas, particularly those in Asia, taste different to the Portuguese version but are still very similar. As well as China and Macau, you’ll also them in Chinese-influenced bakeries throughout Asia particularly in Cambodia, Singapore, Malaysia, Hong Kong, and Taiwan. More recently, food blogs and TV chefs have begun singing the praises of the nata and bakeries around the world have begun selling them. Some are good and taste like a real nata, while others are really just a custard-filled tart. The nata boom didn’t just happen outside of Portugal, it happened in Portugal as well. In Lisbon, several new cafés opened as Portuguese entrepreneurs similarly jumped on the custard craze. Many have won awards including the O Melhor Pastel de Nata (the best pastel de nata ) award. Despite all of these new cafés, Pastéis de Belém hasn’t really been affected. In 2017, Pastéis de Belém was the most reviewed eatery in the world and clocked up 10,000 TripAdvisor reviews in that year alone. So, yes, be prepared to queue if you decide to visit. This is probably Lisbon’s biggest attraction. It’s a pastel de nata. If you’re in the Azores, it’s a queijada de nata. Some people, particularly from the north of Portugal, say nata rather than the full name but basically it’s a pastel de nata. For whatever reason, the name has been anglicised from pastel de nata to Portuguese custard tart or Portuguese egg tart. But why? We’ve bothered to learn the correct name for plenty of other foods from around the world. Words like taco and kebab have entered our everyday vocabulary as has paella, sushi, lasagna, and moussaka. Why can’t it be the same for Portuguese food? Portuguese words can be hard to pronounce, it’s true. But that’s not really a valid excuse for not giving it a go. We’re quite happy to take a stab at words like croissant, mille-feuille, and crème brûlée, so why not Portuguese words as well? In fact, it doesn’t make any sense that we wouldn’t: pastel de nata is much easier to pronounce than, say, croissant (for reference it’s pash-tel de nah-ta). Is it really that big a deal? Probably not. The Portuguese don’t actually complain about this. Unlike some other European countries where you won’t get served unless you speak the language (ahem France! ), most of the Portuguese are very accommodating to the fact that other people don’t speak their language. They’re so accommodating that they even turn a blind eye when tourists ignorantly just speak Spanish to them. Look around the Algarve and Lisbon at all of the tapas bars and you’ll see just how accommodating people are. Portugal has its own word for a tapa (petisco), but given that tapa is the word most tourists know, many Portuguese bar owners use the Spanish word instead. The pastel de nata isn’t the only foreign food that has been anglicised, of course. Although we have adopted words like croissant and kebab, there are an endless list of other words that we haven’t bothered to learn. Which is why I’m not advocating that we call everything by its proper name. Instead, I propose that we give everything an English name. In the same way as a pastel de nata is now internationally known as a Portuguese custard tart, a croissant will now be known as a French buttery flaky pastry. It may seem a tad ridiculous, but it’s the fairest system. Below you’ll find a few examples of some cakes and desserts and their new Anglicised names. Does it matter? Probably not. If you go into a bakery, and they have the words “Portuguese custard tart” written on the sign you’re probably better off asking for that. Just remember that in Portugal to ask for a pastel de nata (or pastéis de nata if you’re ordering several). If you’re visiting Portugal, the following are just a few places that you should visit to try a pastel de nata. Remember that you can get them at any café, and just because they’re not on this list that doesn’t mean they’re not worth trying. More info about the best pastéis de nata in Lisbon here. Outside of Portugal, pastéis de nata get a little more pricey. The UK is currently leading the way for the most expensive pastéis de natas in the world, and claims almost all of the top spots. Unsurprisingly, it’s large and expensive cities like London, Dubai, and Singapore that have some of the most expensive natas. Surprisingly, though, it’s the UK’s second city that claims the top spot for most expensive pastel de nata in the world. An espesso (called a bica in Lisbon or café in the rest of Portugal) pairs perfectly with the pastel de nata. If you prefer a milkier coffee, particularly in the morning, try a meia de leite or a galão. If you’re not a coffee drinker, most cafés will have tea and some will also have a glass of milk on the menu. Port, particularly an LBV or a good tawny, also goes well with a pastel de nata. You’ll usually find a shaker full of cinnamon on the counter or somewhere nearby and some places, like Pastéis de Belém, will also have a shaker full of icing sugar (powdered sugar) as well. The cinnamon definitely works well, and is highly recommended. The number of calories in a pastel de nata really depends on the recipe, but typically it’s somewhere between 200 and 300 per nata or around 250 on average. That’s about the same number of calories as a Snickers, but obviously this a lot tastier. To burn it off, you would need to run for around 30 minutes about 5 miles per hour. But, don’t worry about that just now. Have another one. Life’s too short anyway. Have you tried a pastel de nata? Where did you try it? Share you reviews, tips, and thoughts by leaving a comment below. Oh I love this! thank you for writing this article. I am Portuguese and I agree with it 100%. Recently I made a video talking about the different ways to eat a pastel de nata, and I found myself forced to say “Portuguese custard tarts” otherwise many would not understand.